Last week Jason's mom came to help us out and she brought along with her a huge box of Jason's old things. Class pictures from kindergarten on, report cards, hand-knitted baby booties, and all kinds of other treasures from Jason's childhood. 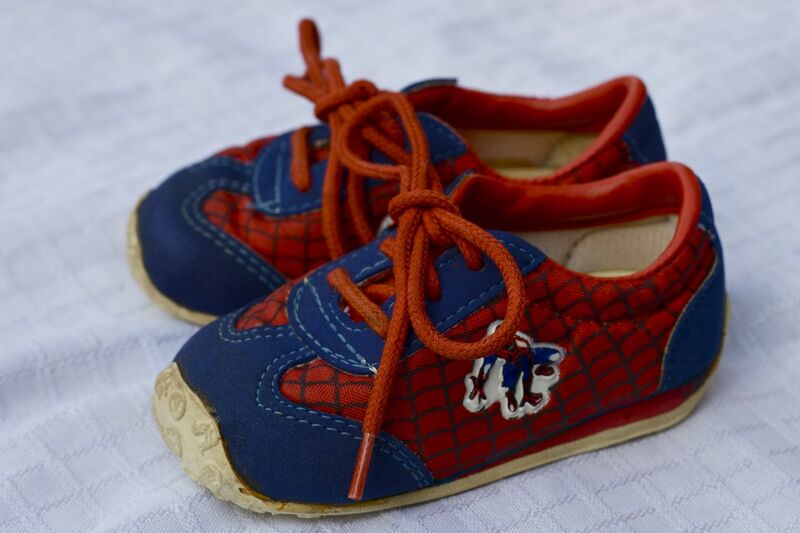 We found these seriously cute little Spiderman shoes in the box too. They are too small for Alex, but Henry will totally be sporting these when he's a little bigger. Hard to believe that these 35-year-old sneakers still look so cool! Those are the radest shoes I have ever seen!!! I am feeling quite jealous of you at the moment! :) So fun you have another little boy so they will not go to waste! Adorbable!!!! And love how they were daddy's.